You just know that when a new Android tablet gets promoted they are going to take a jab at iOS tablets if they get th chance, and thus it would appear that Samsung has taken that chance with a commercial for their Samsung Galaxy tab 10.1, a video of which we have for your viewing pleasure below. The Samsung Galaxy Tab 10.1 commercial comes our way courtesy of the guys over at Phone Arena and by way of the SamsungMobileUSA YouTube channel and is the first commercial for the Android 3.1 Honeycomb tablet. 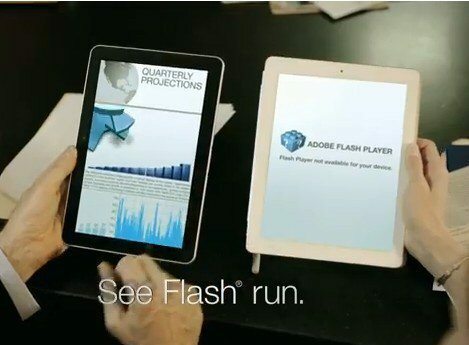 It appears that old Sammy took the opportunity with their first Samsung Galaxy Tab 10.1 commercial to give Apple a little slap over the fact that their Apple iPad 2 doesn’t support Adobe Flash as you will see in the footage below. Other than that the advert lets you know that the Galaxt Tab 10.1 is thinner and lighter than other tablets and that if you love gaming you’ll love gaming on the Android tablet. So I’ll leave it there and let you head on down to check out that little swipe from Samsung to Apple…enjoy. hhhhhh Apple will always be on the top of your head samsung Idiots. With flash or without The ipad 2 is always the winner. Why didn’t samsung show in the commercial that Ipad 2 has 70000 best apps in the world and galaxy tab has 220 apps that people used to play on the old ipad. hhhhhhhhhhh Samsung is the worst.